I want to know which creative thinker came up with a "bread" bowl. That person was ON to something. Of course, most of us need to avoid bread bowls (especially if they are filled with a clam chowder). Snack Girl has come up with her own BOWL concept. A cantaloupe bowl! For a mere 100 calories (or less depending on the size of your bowl), you have a great way to get your fill of fruit to start your day. I added 1/2 cup of low-fat yogurt and some blueberries. On average, you will have 200 calories, 25% of your daily value of Calcium, 192% of your DV of Vitamin C, and 9 grams of protein. AND, you have fewer dishes to wash.
You can also add some granola (for crunch) or use cottage cheese and any other fruit to the top. The idea is to add more protein so that you don't get hungry later in the day. Just like the Watermelon Feta Salad, we are adding some dairy to amp up the protein. It also takes a WHILE to eat it. This is not a grab and go breakfast - and that is a GOOD thing. Savor the lovely flavor of fresh cantaloupe! And check out Bacon Cantaloupe Bites for a meatier pairing. Do you have green tricks for making fewer dirty dishes? Please share. Cut cantaloupe in half and spoon out seeds. Save one half in fridge of later use. 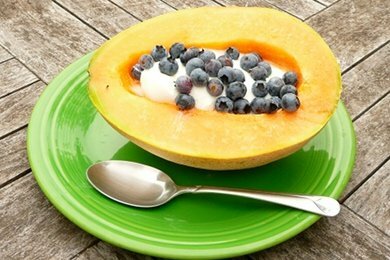 Spoon yogurt into cantaloupe and add blueberries. Grab a spoon and enjoy! I guess I could try this with honeydew if I don't like cantaloupe. i love doing this! i make chicken salad w/ nonfat plain greek yogurt & put it in cantaloupe bowls! so good! While on my honeymoon in Hawaii, many, many years ago, I was hooked on a place called "Half a Papaya." The concept was that simple---a papaya cut in half with your favorite topping. I was addicted to the yogurt, berries and granola. I told my husband that if they had one of these places at home, I could easily lose weight! Of course, we came back home and I was disappointed that what Chicago called a papaya (looked like a shriveled up mango), did not remotely resemble the papaya in hawaii. Thanks for reminding me of the concept. I'll have to try it out with cantaloupe now! cottage cheese. Thank you snackgirl. I love this idea. Does the spoon just cut through the cantaloupe then? I need to eat more fruits- this has me craving them! Half a cantaloupe has anywhere from 200% to 275% of vitamin A and about 250% vitamin C (daily requirements). It also has a lot of potassium, vitamin K, folate, magnesium, phytonutrients and omegas. Blueberries and yogurt are minor nutrition in such a small amount by comparison. Papaya, corn and cantaloupe have a huge amount of lutein and zeaxanthin which help to protect the eyes from macular degeneration and ultimate blindness. Kale has the most.